PLOT UPDATE: The Roman army, led by General Cominius, launched a counter-attack on an invading Volscian army. During the ensuing battle, Caius Martius single-handedly took on the troops of the Volscian city of Corioles and battled his arch-nemesis, Volscian general Tullus Aufidius. The Romans are victorious and Martius is awarded the honorific name of "Coriolanus". These two random guys come on stage to put cushions out for the Senate and have a cheery little conversation about the merits of Coriolanus. The chief take-away message is "Coriolanus: he hates the people, but at least he's honest about it". Did we mention Coriolanus hates the people? Oh, we have? Well, have you gotten the message yet? Here we have another one of Coriolanus's little tantrums, as he storms out of the senate rather than sit and listen to himself be praised. I mean, it's all admirable and stuff not to want people to make a big deal of what you perceive as just being your job, but Coriolanus really does manage to take this attitude into new levels of petulance. Also, Cominius has a great speech about how Coriolanus is a fantastic solider and is really good at killing people, but he never once says anything remotely resembling "Oh, and he'd be a really good civilian administrator". Apparently that's not a required skill. 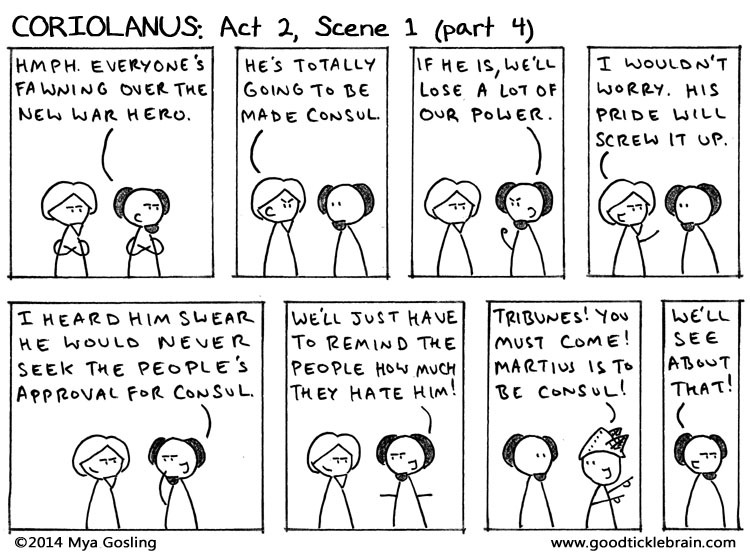 Coriolanus is annoyed for several reasons. First, as we've already established, he doesn't like people making a big deal of his military accomplishments, so he's not exactly thrilled about having to show off his scars to the people to convince them that he's a great war hero. Secondly, he doesn't believe the people should even have any role in the appointment of consuls, given how fickle and pointless they all are. OK, so maybe the people are a little fickle. In their defense, the whole "giving your voices to the consul" ceremony is almost entirely pro forma, so it's not like they're used to the idea that their voices actually count for something. This is a fantastic and rather hilarious section, where you have Coriolanus, all brimming with righteous indignation and dressed up in an incredibly filthy and torn outfit, attempting to beg the people whom he despises for their support. The people, it must be said, are remarkably accommodating, and never say anything like "Hey! Aren't you the guy who is always saying how stupid and worthless we are, and how we should all be hanged?" Of course, just when it looks like Coriolanus has gotten away with it, the tribunes come back and remind everyone that they're always complaining about how much Coriolanus hates them, and that actually, yes, he wasn't very nice when he asked us for our voices, was he? Now, I try to stand up for the common people as much as possible, but in this case they really are a lot like sheep, instantly following whoever was the last person to speak to them.